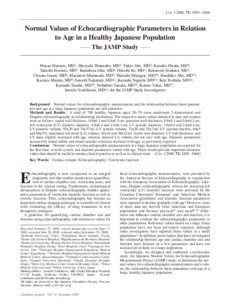 Background: Normal values for echocardiographic measurements and the relationship between these parameters and age in a large Japanese population are still unknown. Methods and Results: A total of 700 healthy Japanese aged 20-79 years underwent 2-dimensional and Doppler echocardiography at collaborating institutions. The respective mean values obtained in men and women were as follows: septal wall thickness, 0.9 ± 0.1 and 0.8 ± 0.1 cm; posterior wall thickness, 0.9 ± 0.1 and 0.8 ± 0.1cm; left ventricular (LV) diastolic diameter, 4.8 ± 0.4 and 4.4 ± 0.3 cm; LV systolic diameter, 3.0 ± 0.4 and 2.8 ± 0.3cm; LV diastolic volume, 93 ± 20 and 74 ± 17 ml; LV systolic volume, 33 ± 20 and 25 ± 7 ml; LV ejection fraction, 64 ± 5 and 66 ± 5%; maximum left atrial (LA) volume, 42 ± 14 and 38 ± 12 ml. Aortic root diameter, LV wall thickness, and LV mass slightly increased with age, whereas indexed LA volume did not vary with age. Diastolic parameters assessed by mitral inflow and mitral annular velocities declined with age, as previously reported. Conclusions: Normal values of echocardiographic measurements in a large Japanese population are reported for the first time; several systolic and diastolic parameters varied with age. These results provide important reference values that should be useful in routine clinical practice as well as in clinical trials.